News from the Dutch archives. Several Dutch archives have limited opening hours during July and August. Check their websites for details. The Drenthe Archive presented the book In de versnelling, about cars in Drenthe in the last 100 years. There is also an exposition on the same topic in the Drenthe Archive (until August). The Gelderland Archive announced a major overhaul of their website. The new website will launch in July. The archive also announced that one million Gelderland death acts are now indexed in Genlias. The National Archive announced a new website about Zuid-Holland history: www.geschiedenisvanzuidholland.nl, a cooperation of several institutions in Zuid-Holland. The new website seems to be available in Dutch only. It was already possible to search for gezinskaarten on the website of the Amsterdam Archive, but you can now also see the scans online. 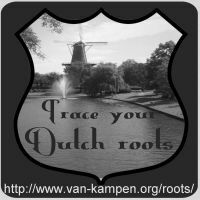 A great service if you have relatives in late-19th or early-20th century Amsterdam. This is a paid service: Searching the index is still free, but you have to pay to see scans.